Epact: Nocturnal unsigned, 16th century ? This is such a simple instrument, with no date or signature, that even a dating to the 16th century is speculative: it could be from the 17th century. A volvelle on the reverse side of the nocturnal relates to an alternative way of finding the time at night, but must be used in conjunction with another instrument, namely a sundial where the shadow is cast by the moon. 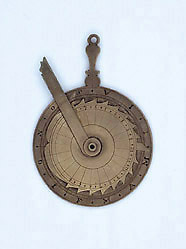 The volvelle then allows an approximate calculation of the solar time.